The south elevation of St Martin's, Marple. 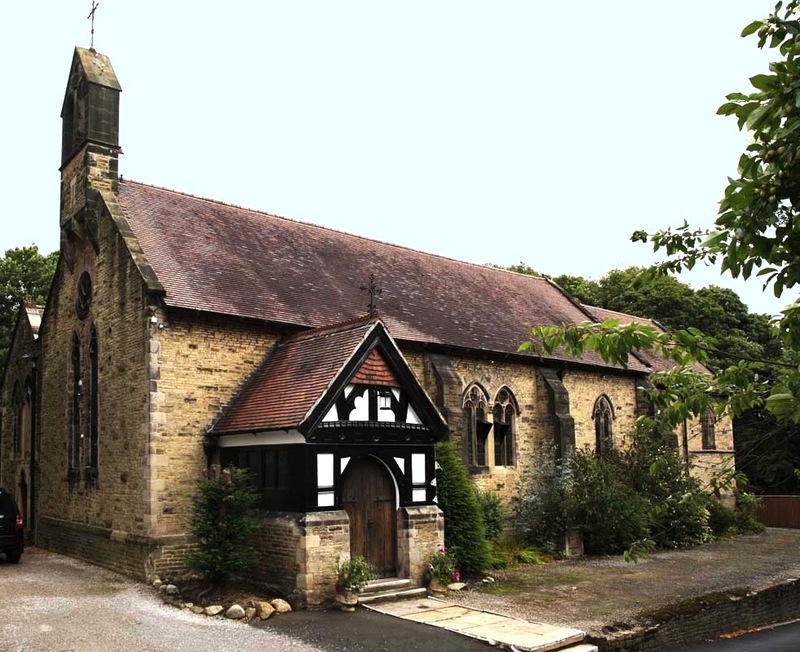 St Martin's Church, Brabyns Brow, Low Marple, is a Grade II* listed building, a commission passed over to the architect J. D. Sedding (1838-1891) from his elder brother Edmund, who had died in the early stages of planning. It was built in 1869-70, with its north aisle and north chapel added in 1895-6 and 1909 respectively by Henry Wilson (1864-1934). Wilson had been Sedding's chief assistant. According to the listing text, the church is built of "[s]necked stone with ashlar dressings and clay tile roof." Marple is close to Stockport, in Greater Manchester. 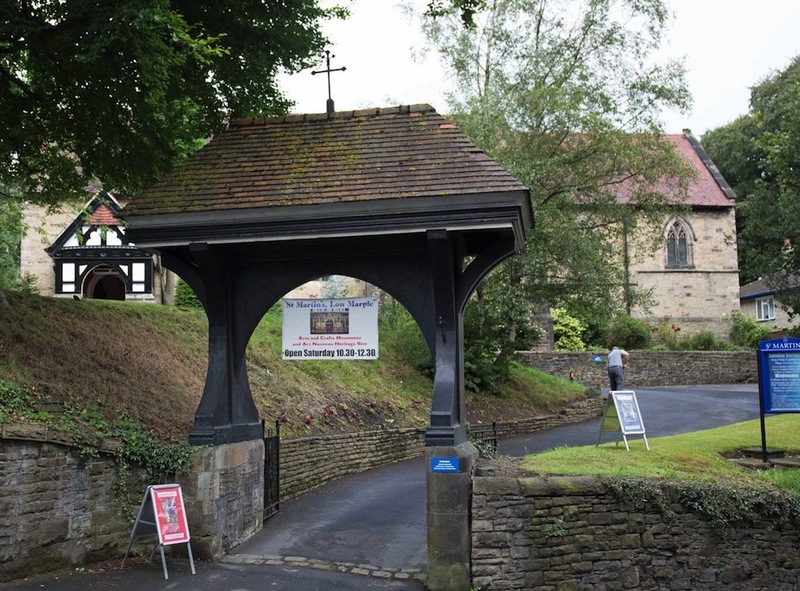 From left to right: (a) The lychgate. 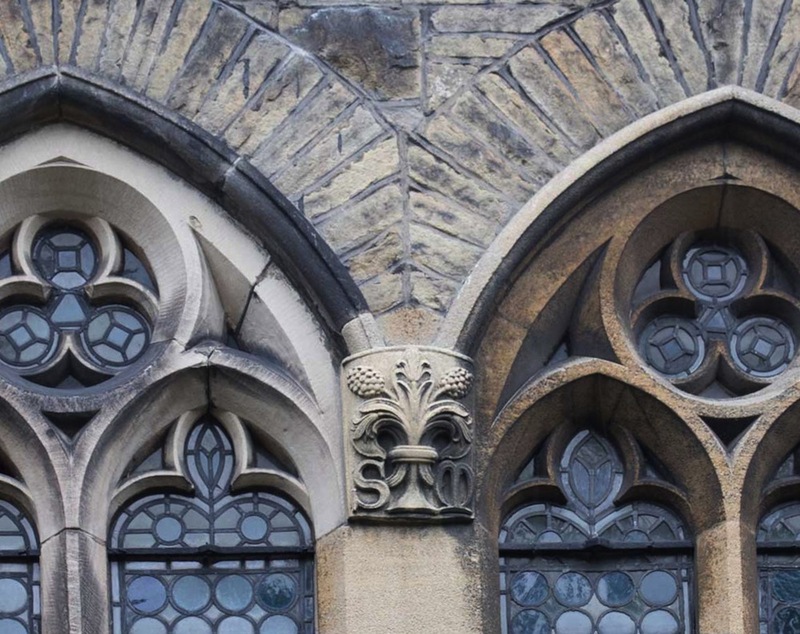 (b) Close-up of the geometric window tracery on this side (the south side of the nave) with carved "S M" initials and natural detailing. 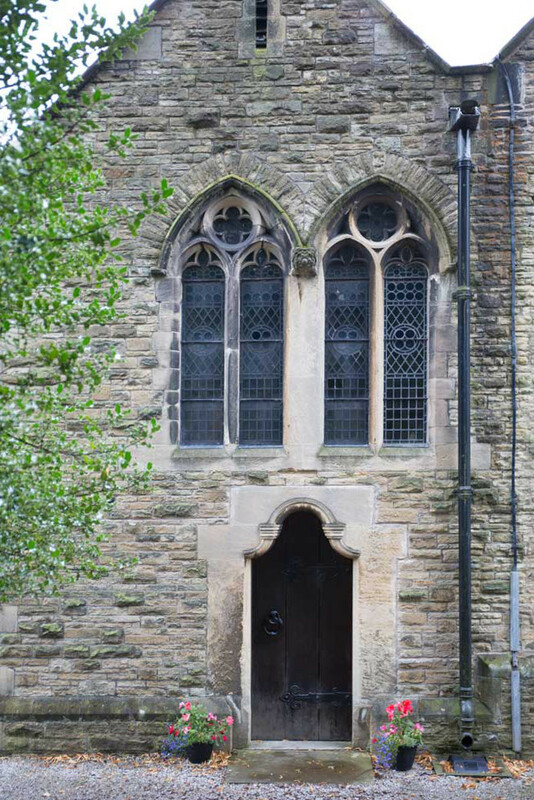 (c) Close-up of the attractive south porch. The basic structure has been described as "unpretentious" (listing text), its design "quiet" (Pevsner and Hubbard 277): there is a three-bay well-buttressed nave, a two-bay chancel, the gabled and half-timbered porch, the north aisle and chapel added by Wilson, and a bell-cote. "Yet in the rhythm of the S fenestration one can sense a designer of uncommon sensitivity" (Pevsner and Hibbard 277). Left to right: (a) The north elevation showing the aisle added by Wilson, also the protrusion in the wall accommodating Wilson's memorial to Maria Hudson, a large figure of St. Christopher carrying the young Jesus — see next part. (b) Exterior of Wilson's north chapel. 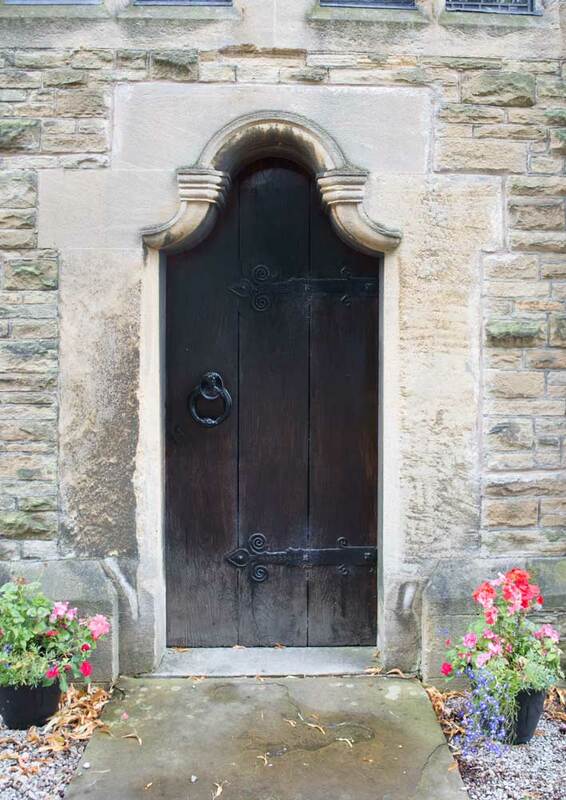 (c) Close-up of north chapel door. The exterior of St Martin is deceptive for more reasons than one — partly because of its subtleties of detail, and partly also because of the vision behind it. 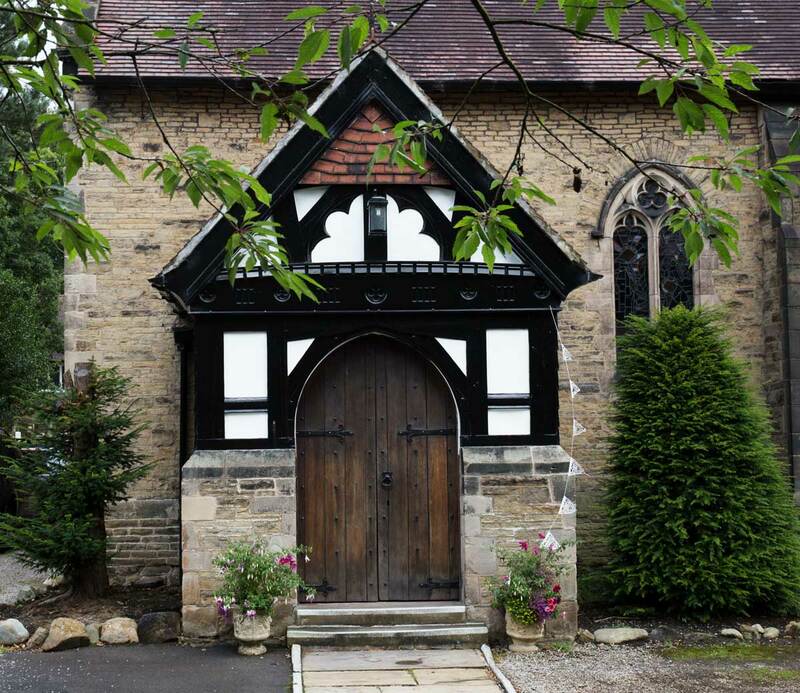 Unusually for such a setting, it was built as a Tractarian church, the gift of sisters from a wealthy local family — the Hudsons. 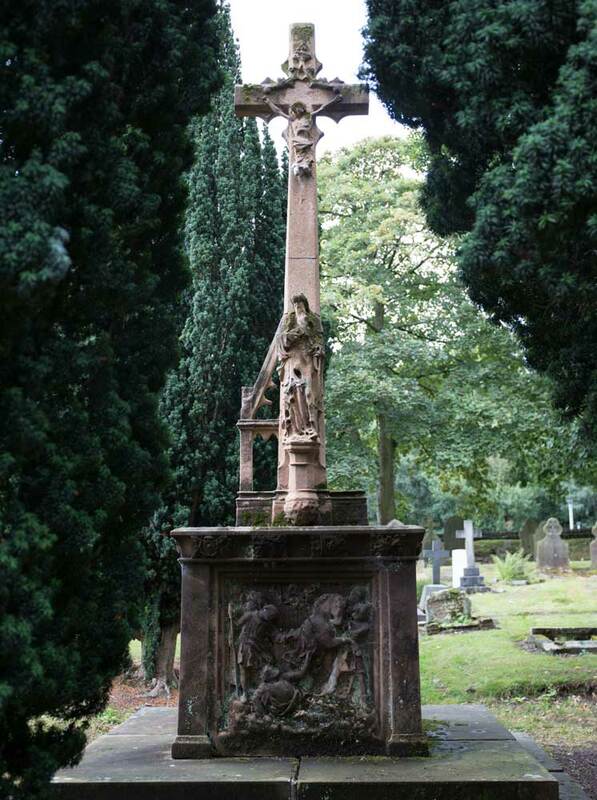 In the churchyard is a weathered cross, seen on the right here, designed by Sedding himself. This shows Jesus crucified, and St Paul; around it are memorials to various members of the Hudson family, including Ann Hudson, who had founded the church and commissioned Sedding to design this building. It was to reflect the style in which the family lived, so there would be more surprises in its rich Arts and Crafts interior. "Church of St Martin, Marple." British Listed Buildings. Web. 4 September 2016. "History and Heritage of St Martin's Church." St Martin's Low Marple Heritage Trust. Web. 4 September 2016. Pevsner, Nikolaus, and Edward Hubbard. Cheshire. The Buildings of England. London: Penguin, 1971 (2001 reprint). Whittaker, Mark. 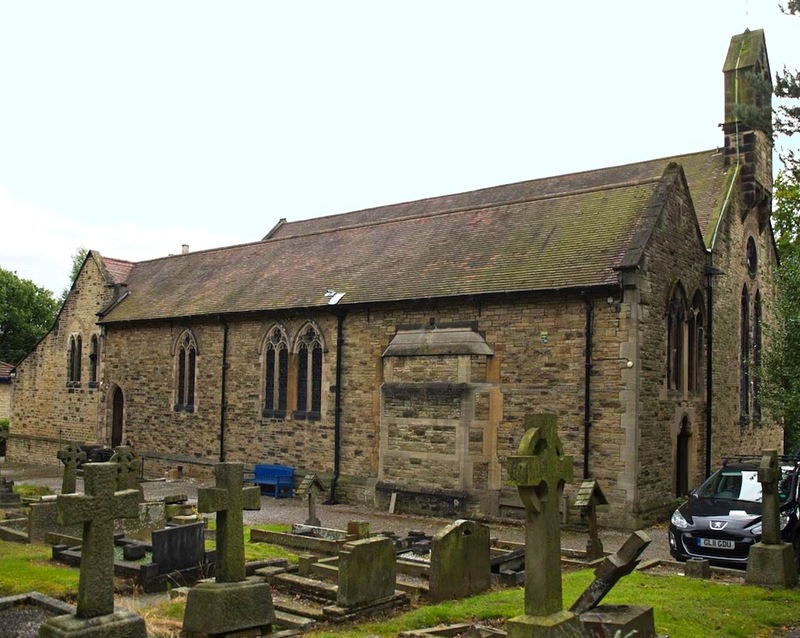 St Martin's — Low Marple Web. 4 September 2016.